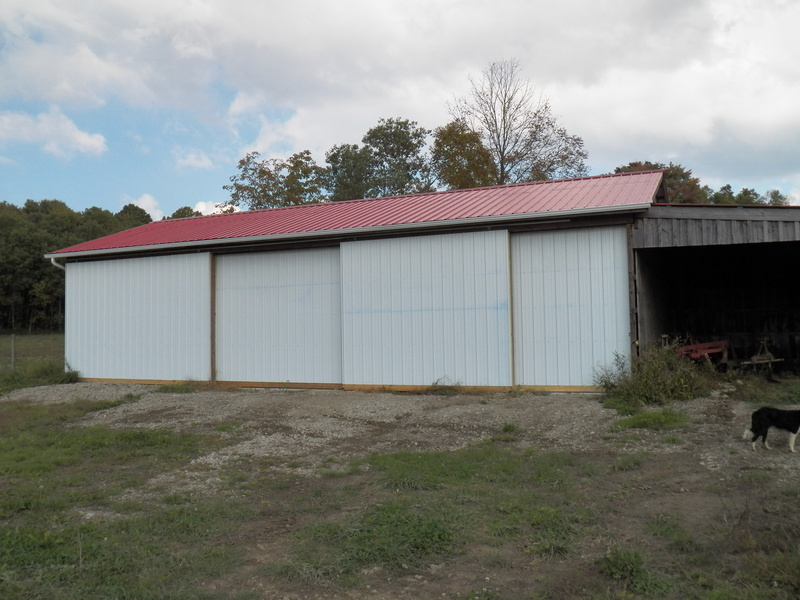 Finally, after several years, I scraped together the money to build doors for the machinery shed. This building was built on a shoe string. It has quite a bit of recycled lumber in it. The siding was made from pine trees grown and milled here on the farm. The steel roof was constructed from “seconds” destined for the scrapyard. I built it so it is facing south and open to that side. Most of our wet and snowy weather stayed out, but every now and then, everything inside got covered in moisture. I wanted doors. Last year, I managed to dig out the dirt floor and pour concrete inside the building. It made it so much better to move things around and kept the equipment out of the mud. My equipment is old, but in good condition. I want to take care of it. Keeping it inside just makes sense. It took me quite a while to acquire what I have by trading up, being patient and saving before I purchase. It takes longer, but is very much worth the wait to avoid the burden of debt. I am actually excited to put my stuff away this fall. It takes a whole day to organize everything and it never fails one piece will be in the very back the day you need it most 😮 Oh well, I just love to see it inside, clean, dry, greased and ready to go when needed. I am sure my farming grandparents would be, pleased with my efforts and that pleases me too. The building measures 24×48 with a 16 foot lean-to. I built it for much under current construction prices. I did pay for some help and materials, but by taking my time, the costs have been greatly reduced. Recycled lumber and home grown siding also knocked the heck out of the bottom line. I will recommend, keeping your tools stored inside when possible and thinking outside of the box when considering a building project…. and most of all…don’t be in a big hurry!